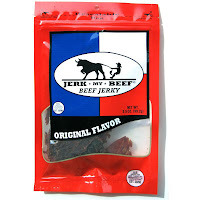 Jerk My Beef is a brand of JMB Jerky, Inc. based in Austin, TX. It's owned and operated by Shaun P Kerns who's been making and perfecting jerky for five years. The company has been selling it's jerky locally for the past couple years, but just this year launched a website to begin selling globally. Based on the company's literature, the story behind Jerk My Beef seems like many others, where Shaun grew tired of all the other jerky brands tasting like shoe leather, and so set out to make his own. Right now, Jerk My Beef makes two flavors, this Original, and a Peppered. Beef, sugar, water, soy sauce, apple cider vinegar, salt, flavorings, paprika, smoke flavoring, citric acid. The first thing I taste from the surface of these pieces is a light sweetness, and a light smokiness. With some sucking, I can pick up a light saltiness. The chewing flavor starts with a tad more sweet that quickly dissipates, a touch more smokiness, and maybe a bit more saltiness. I'd the say flavor that seems to represent this jerky the most is the sweet. It seems to be at a moderate intensity, but dissipates about half-way through the chewing. At that point, I'm left with a combination of light smoky and light salty flavors. There are a few bites I've noticed a more intense liquid smoke flavor. Some of the smaller pieces have some black pepper on them, and I do pick up a moderate peppery flavor, but only from those pieces. I'm not picking up any natural meat flavors. However, some of these pieces have a fair amount of fat streaks on them, and these fat streaks do contribute a fatty or "beefy" flavor that's easily noticeable. 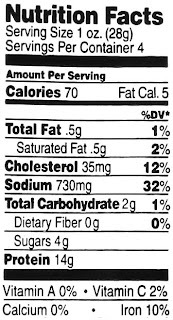 The level of saltiness in this taste light, despite the nutrition facts labels showing that it has a higher sodium content. 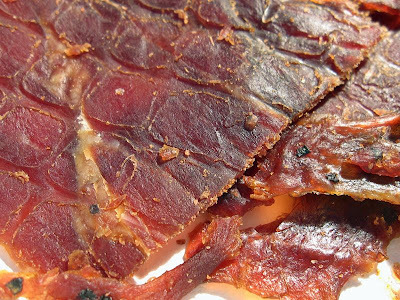 For being an Original flavor, this jerky has a very mild flavor, with no seasoning that I can detect other than the black pepper on a few smaller pieces. Overall, this is a sweet jerky with some light smoky and light salty flavors. These are slices of whole meat, sliced slab-style and sliced thin, in small to medium sized pieces. It's a dry jerky, with a dry but slightly oily surface feel. The pieces have a lot of flexibility, and mimic something like soft pliable plastic. Tearing pieces apart seems easy to do, while chewing seems "chewy", but overall easy. The chewing texture starts out feeling soft and pliable, maybe just a bit waxy. They seem to chew down to a soft mass easily and quickly enough. At that point, it doesn't really feel like real meat, it's like chewing soft, thin sheets of rubber that break down into little bits, but never resembling anything steak-like. As I reported above, some of the pieces have a fair amount of fat streaks on them. I didn't notice any gristle, but I did find one piece with some significant tendon, resulting in some unchewable tissues. I didn't find anything stringy, though. In terms of clean eating, my fingertips have a slight bix of oily/waxy film, but still dry enough to where I can type on my keyboard. Tearing pieces apart seems to drop some tiny meat fragments on my lap. Jerk My Beef sells this Original beef jerky from its website at a price of $6.00 for a 3.5oz package. If you bought eight packages they'd tack on shipping fees of $14.99, for a total price of $62.99. That works out to a price of $2.25 per ounce. 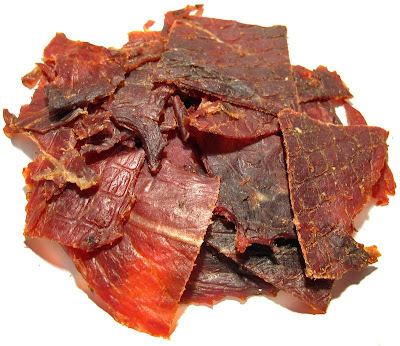 For general jerky snacking purposes, at the $2.25 per ounce price, it seems to provide a fair value. I'm getting just enough snackability to keep me eating, but the flavor and meat consistency doesn't really inspire me. And that $2.25 price per ounce is a little higher than what you'd pay for national brands at the grocery store, yet I think you're getting the same quality. This Original beef jerky from Jerk My Beef seems to provide enough flavor to keep me snacking away, though it doesn't really offer a good flavor or good meat consistency. The flavor is dull, being mostly a sweet flavor, with some smokiness, a light saltiness, and sparing amounts of black pepper on a few pieces. The meat consistency doesn't really feel or chew like real meat. Words like "rubber", "waxy", and "plastic" keep coming to mind, which coincidentally enough is very much like what you'd get from mainstream jerky manufacturers. Though overall, it's still easy to eat, and nothing like the "shoe leather" the company's literature contrasted itself against. But it's a very mild, rather uninspiring jerky. It's still good enough to snack on while driving or watching a movie, but not anything I'd eat to enjoy. For my recommended beer pairing, I'd suggest something strong on flavor, like an IPA. Finally received my online order of Original flavor beef jerky. I am not a beef jerky connoisseur, but I can tell you it best I ever had. It’s very tender, easy to eat (my two year old can eat it easily in small pieces), and not overly sweet. I don’t have to take a grip and feel my jaw bone is about to come off like other jerky’s I have eaten. Yes, it’s very snackable for kids, and good alternative to greasy chips, or sugary candy. Let the Jerky speak for itself … trust me.